In looking forward to our move to the new special collections building, I’ve been thinking a bit about how the Russell Library got its start. I had a notion to look through some of our photograph files that document the library’s early days and found some real gems to share! As we look forward to our next big step, we’ll use the blog to take a look back to how it all began. Over the course of the next decade, Senator Russell wavered back and forth over the idea of donating his papers to the University Library, committed to the idea but worried that in practice his papers might get lost in the shuffle of everyday operations. 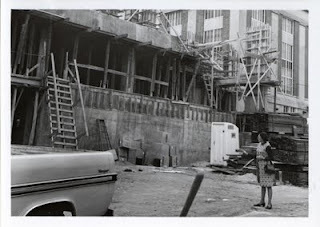 Then in 1969 William Norton, a Gainesvile attorney and friend of the Senator, suggested a new scheme for the donation: the formation of a private foundation and establishment of a separate library for the papers, affiliated with a university. Inspired by the Everett Dirksen Library, a center for congressional study in Illinois founded on the papers of Senator Everett McKinley Dirksen, Norton wrote to Russell. He described that institutions like the Dirksen were dedicated to maintaining “a record of the life and influence of these individuals upon the affairs of government to better understand the times and events during which their influence were prominent.” Norton’s suggestion appealed to Russell and set in motion the establishment of the Richard B. Russell Foundation and a collaboration with the University System of Georgia Board of Regents and the Georgia General Assembly. This collaboration resulted in the Richard B. Russell Memorial Library at the University of Georgia, but we'll talk more about the Foundation and their next steps in the next post. Below: Barboura G. Raesly, Senator Russell's personal secretary, stands by the construction of the annex to the Main Library building. The bottom floor of the annex became the Richard B. Russell Memorial. 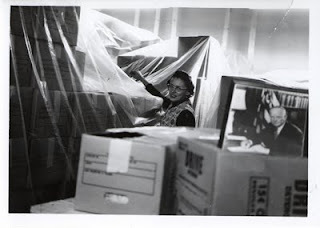 Below: Ms. Raesly stands in the interim storage area with Senator Russell's papers.